A rewarding scholarship for Boğaziçi University students applying to WUSTL Summer Program! $7,500 scholarship for two students! APPLICATION TO BOĞAZİÇİ UNIVERSITY (OFFICE OF INTERNATIONAL RELATIONS): March 1, 2019. Please note that, if deemed necessary, students may be invited to interview. The selected student will be nominated for the summer program. The student must complete the application process and accept admission to the program. Please contact exchange-outgoing@boun.edu.tr and ece.gunay@boun.edu.tr for the details of the scholarship opportunity. Native English speakers are exempt from providing ELT results. Test waivers are available for applicants who meet specific criteria. Please contact usfor more information about exemptions and waivers. APPLICATION OPENS: On January 1, 2019, the application for international summer study becomes available to applicants. APPLICATION DEADLINES: The deadline to apply for SESSION A is April 1, 2019. The deadline to apply for SESSION B is May 15, 2019. ADMISSION DECISION: Admission decisions are sent by email and made on a rolling basis, usually within seven to ten (7 - 10) business days. Decisions may take longer during peak application submission periods. We encourage you to apply early. SUBMIT PROGRAM FEE: To accept admission to the program, submit the program fee by international wire or bank transfer. SESSION A deadline is May 1, 2019. SESSION B deadline is June 15, 2019. 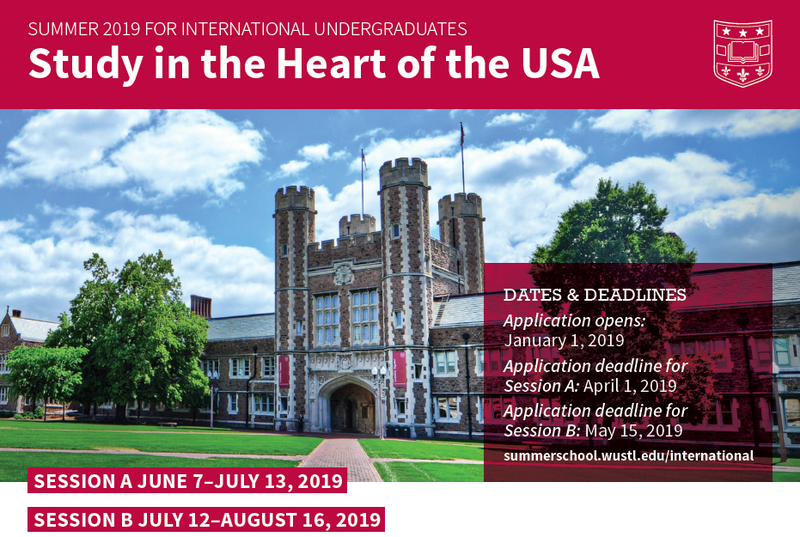 WELCOME TO WASHU: Session A students participate in the program June 7 through July 13, 2019. Session B students participate in the program July 12 through August 16, 2019.